Christmas was a blast.... :) Doesn't that mean New Year is around the corner? Regardless of how messed up our holidays are, we are celebrating. Frank's labs remained very stable over the weekend. Everything is about the same, and his platelets are still increasing. He also said his pain is getting a little better each day. Frank is working everyday, which is so good for him. Chase is at Urban Plunge this week. The youth are running VBS for the inner city kids. They sleep downtown all week and minister to the kids, play with them and get to know them. We are taking dinner to them tonight, so I'll get to hug his neck. Zach and Chandler are catching up with friends ~ and boyfriend ~ before going back down to Greenville for some one on one grandparent time. Our thoughts are heavy for our friends going through similar journeys: Nanneys, Thorns, Bartons, Carmons, Wherry's and our other patient friends in Little Rock. We pray for you guys, and hope you are feeling the loving arms of our Saviour today. Frank's labs yesterday were a down just a bit. All except for his platelets, which is good news. He usually struggles with making platelets after a treatment. They were 60, up from 37. We are leaving for Greenville in the morning for the annual Christmas in July party. We're looking forward to seeing family! We're also excited to be getting Zach back from his church trip tonight. We already know he had a good time, because even with a cell phone, we only got one text message all week. Chandler started running fever last night. She hasn't felt good for a few days but no other complaint except for fatigue. * protection for Frank's body while being around people this weekend. that he would stay free from infection. that his counts would continue to rise. We've been home a week now. We are so amazed at God's goodness. He has brought us so far and we have blessing to be thankful for every step of the way. We have been ministered to and Frank and I are both thankful for the peace we've begun to feel in certain areas. You didn't click on anything different... I'm just playing around with the templates. I was going to say I'm bored, but I have so much I should be doing... it's really more like procrastination from my "to do" list. Frank rested most of the weekend. He still very tired and uncomfortable in his ribs and back, but so glad to be sleeping in his own bed! He had labs today at West Clinic. There were some changes in his numbers, but the good news is he didn't need any transfusions. Yeah! His white count dropped to 2.2, which is slightly above being neutrapenic. His platelets held their own at 37. We were excited about that! His Hct and Hgb both fell to 27 and 9, which explains his being winded easily. His body is strong and he'll continue to recover over these next few weeks. He won't get labs drawn again until Thursday. He is going to Elliott for a few hours. Even if he had strict orders to stay home, he would go in. So I just encouraged him to wear a mask anyway and be really careful. He's blessed to have a job he loves and I know he has missed everyone in the office. and for sweet family time together. As you read this, Frank is downstairs watching TV from home in Germantown. WE ARE HOME! We saw Dr. Barlogie this morning. He was talkative about everything except Frank's treatment. He was pleased with how well he tolerated everything.... which he did!! Answered prayer!! "Come back in 4 weeks. Labs bi-weekly at home" was all we got out of him. Frank's platelets were 21 today. They have to be 50 to pull the central line, so they transfused him, only to have them increase to 33. So they gave him another bag, which got them up to 44. They bent the rules a bit and pulled the line anyway. He was so so glad to have that out of his chest. But he's under some pretty strict orders to not lift anything, or use his right arm or move it around a lot. I was never so glad to have the kids around! They pitched in and help us pack up the apt. Chandler and I's cars were so loaded down! We worried it wouldn't all fit, but it did. We got a celebration milk shake and hit the road in 5 o'clock traffic. All we could see was the Memphis-Ark bridge at that point! The nurse said Frank would probably be neutrapenic again by Monday. He stopped getting the growth factor shots, so we should expect to see a drop. He will still be recovering even though we are home. He's suppose to lay low and stay away from crowded places. It was so good to be home. My mom and dad met us here with our cat and dog ~ who, by the way, don't love us anymore. Casey followed my dad out the door as if to say "wait for me". They helped me unload the car knowing Frank couldn't and we had a quick dinner together. We hadn't seen them since we left, so that was a sweet treat. Even though we are glad to be home, we made friends with new patients this time. Precious couples from Houston, Miami, Kentucky, Detroit and Nashville. One lady is 36 yrs old and has an 18 month old baby. I am finding that my thoughts are still in Little Rock this evening as we've left our friends there. I pray for God's healing mercy on each one of them. Thank you for your prayers, your emails, and messages, texts and treats that encouraged us each day!! We love you so much!! Psalm 33:20-22 We wait in hope for the Lord; he is our help and our shield. In Him our hearts rejoice for we trust in his holy name. May your unfailing love rest upon us, O Lord even as we put our hope in You. Today's been good. Frank's white count is coming up. It's 0.57 today. His platelets were 10, so he got an infusion today. The CRP came down too. His recovery is going well and talk of going home is at least being discussed. Yippee! We see Dr. Barlogie Friday. We're hoping to be home by early next week if not before. Let's pray for that! Our better news came from the MRI report. Frank has been hurting in his back and ribs. He was so worried that these treatments weren't working. But we got good news today that that is NOT case. Praise the Lord! The MRI showed no new lesions. We are so relieved, of course, but I am careful never to forget that even though we are "all in this together", it is Frank that carries this disease in his body. The burden of uncertainty and fear that he's had these past few days has been so heavy. I truly believe some of the sweetest moments spouses can share are together in prayer. We've cried out to God that these treatments are working, and we praised Him together for His mercy on Frank. His mood and disposition has already changed this afternoon. My sister Lisa came to see us with her kids. Julie and Frank read books together while our kids and Jimmy and Alexis swam most of the day. They had a good time hanging out, even finding time to excercise, and paint pottery! The change of pace was nice and we loved their visit. Psalm 116:1-5 I love the Lord, because He has heard My voice and my supplications. Because He has inclined His ear to me, therefore I will call upon Him as long as I live. The pains of death surround me, and the pangs of Sheol laid hold of me; I found trouble and sorrow. Then I called upon the name of the Lord; "O Lord, I implore You, deliver my soul!" Gracious is the Lord, and righteous; Yes, our God is merciful. LATE NIGHT UPDATE FROM FRANK- As I lay in the bed tonight (1:15am), punching the remote, I came across a really neat TV channel ( The Worship Network ) and heard "It is well with my soul". Not only did the hymn comfort me, but much to my surprize many of the musicians were from my home church. The program was a recording of many great hymns of the faith and filmed at Hope Presbyterian Church. It makes me so proud to be a part of Hope. That was sooooooo cool! Frank and I got to the hospital for labs and then darted over to Dr. Barlogie's office to see him at 11. We got to talk to the sweetest family here from West Palm Beach. We both love moments like that. Dr. Barlogie wanted to do another MRI. He said since Frank's counts are low right now, there is less hyperactivity going on in the marrow, and that would be a good time to get a look at the lesions and what they are doing now. Frank shared with him that he's still experiencing pain his back and rib area. We also asked about what his plans are for future treatment plans, etc. He said he didn't know yet. Frank went for an MRI tonight at 8:45 pm. After seeing Dr. B. we went back over to 7c to see his labs and finish up there. We were so pleased that he didn't need platelets for the 2nd day in a row! They were 28 yesterday, 22 today. His white count also moved up today!! It's 0.04. That is all great news. He was still running a little low grade fever today, and his CRP level jumped from 1.7 to 7, so they ran blood cultures on all his ports. He also got another bag of IV antibiotics. But he's not running fever tonight, so that's great too! The highlight of our day was stopping by to see Deena, our sweet APN that usually follows us. She's been out of town, and is assigned to the bottom floor chemo room, so we don't have her this time. But she talked to us and was really encouraging. We both felt uplifted after being with her. Thank you so much for your prayers for Frank and our family. I hope each and everyone woke up with a sense of enthusiasm this day. I sure did. For me I woke up thinking that I might have a shot at getting out of receiving more platelets today. God blessed me with that little treat. While my counts are all still pretty crummy, Plts 28; WBC .01; Hct 30.3… I won’t have to get platelets this time. That puts a smile on my face. My APN (Cindy) did ask me a bunch of questions about a low grade fever that came up last night. 99.5 is not a lot, but for safety sake, she decided to infuse me with some heavier antibiotics. I’ll take the infusers anytime over an infection. They also ran an EKG on me because my sitting heart rate was about 140. Once Peggy left the room my heart rate went back down so I think everything is working like it is supposed to on that regard. We are excited to have the kids coming back to Little Rock today. They have been “vacationing” at home in Memphis since Thursday. Peace and quite are nice but we miss them and are ready for them to be back here with us. If I haven’t said it lately, I must say it again thank you, thank you, thank you for all your prayers and may God richly bless you this day. I love the sound of the rain ~ when I am inside. It is raining here really hard and the thunder is so loud. We beat it by 10 minutes or so making it back to the apt before the downfall. Frank got another bag of platelets today, and an IV infuser of Magnesium and Potassium to come home with him. The CRP (which we affectionately call 'the crap' ~ hope that doesn't offend) came down a little. That's good, since it's a good indicator of infection. Hence it's nick name. We shared a room with another PAC MED patient ~ a sweet couple from Nashville. Yet another testimony of this place. They live 4 miles from Vanderbilt and their doctor told them to come here. That makes the 5th patient getting the same combo as Frank. The dark humor in me sees everyone pulling a number to wait your turn like Baskin Robbins. "Whose next for PAC MED? NEXT!!" Seriously, it's good to meet others walking the same road as you are. There is a strong sense of family among patients. But if 5 (that we know of) of the dozen or so all got the chemo about the same time, then only a handful have gone before us. That can make your mind wander in the quiet moments of the day. But it does settle its thoughts on HOPE! Hope that this is helping patients respond, and that even with some tweaking along the way, that this is the combo that will kill those ugly cancer cells. It's been quiet with the kids in Memphis. We've enjoyed reading the blog comments, and emails that you send. It may be just the 2 of us here, but we know we aren't alone. With singing lips my mouth will praise You." We hope everyone is having a wonderful day. A day of fun. A day off work!! Frank and I had a quick stay at the hospital this morning. His platelets were 10 today, so he got a bag. White count 0.02. His CRP marker which measures inflammation was up a tad, so they did blood cultures to be safe. Just pray Frank stays free from infection. Several people are getting admitted into the hospital from our unit. Our nurse said, "it's those PAC MED patients". Oops.... She probably didn't mean to say that. We're one of those 4 patients that got those drugs. We are praying that Frank stays healthy through this recovery. It's raining here. That makes me sad for people watching fireworks. The kids are glad to be home for the weekend, hanging out with friends and family. In Honor of this 4th of July Holiday - Galations 5:1 "It was for freedom that Christ set us free; therefore keep standing firm and do not be subject again to a yoke of slavery." forget that everyone wants a field report, no matter how routine I think it might be. For the record today I registered a WBC of 0.08 and my Platlets were 16, down from 31 on Tuesday. Today was the first day for me to receive platlets. Funny thing about platlets, I have been taking so many blood products over the years that I have to get loaded up on Benadryl and Hydrocortzone before I get them. That combination of pre-meds just wipes me out. I've been groggy since about noon. to Memphis around noon today. They are enjoying hanging out in LR with us, but they do want to be with thier friends. So off they went. The evidence of how bad they wanted to go home is that the boys left thier Wii and Playstation hardware here. They'll start missing it Saturday if it rains like its supposed to. We are also bumping into more patents that have been given the PACMED chemo regimne. Today I spoke to my friend Francisco from Miami, who makes the 3rd person we've met doing what I'm doing. From his comments to me he is not progressing like everyone would like, but he is definately a fighter. Lift ol Franciso up in prayer if you don't mind, he needs good news. Being here on a holiday, just me and Peggy, kinda makes us feel like empty-nesters. We plan on going all out by eating home made beenie-weenies, eating watermelon, and driving somewhere to watch fire works from the car. We hope everyone has a fun holiday ! We are so happy it's Tuesday. Yesterday was a yuk day for us... just one of those days you're glad is over. I debated with myself on whether or not I should write that. But from the beginning, we've taken the position that we would be open about what we're going through. And how honest would we be if we ignored the hard days?? Psalm 5: 1-3 Give ear to my words, O Lord, consider my meditaion. Give heed to the voice of my cry, my King and my God. For to You I will pray. My voice You shall hear in the morning, O Lord. In the morning I will direct it to You, and I will look up. Frank got his stem cells. Yeah. The kids came to share the 5 minute infusion with us, and then headed out for some fun. 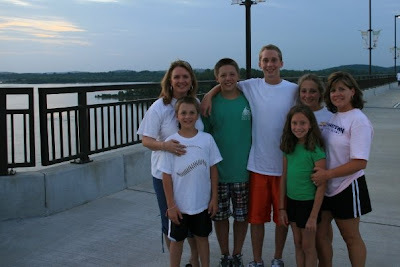 They went to the water park here in Little Rock with one of Zach's friends and his mom. They had a great day and were completely wiped out when they got home. Frank had more energy last night. He slept less and ate more. Or was that me? He got a good laugh at me because I told him to fix his own dinner! He looked at me with his sad eyes but I told him it was because I wanted to take good care of him. He has barely gotten out of the chair for the last few days so while he was up and walking around, I wanted to take advantage of it and get him to do something. It's good for him to be active and makes him feel better in the end. He watched a movie and snuggled with the kids a little before going to bed. We're at the hospital now. His labs are starting to drop, but not too much.